The Civil Defence has to date invested around €80,000 in drone technology with nine drones deployed in the main eight civil defence emergency areas. They may have first come to public attention through their use by the CIA in Pakistan and Afghanistan but drones are now being hailed as a major resource for a variety of emergency services all the way from Australia to West Cork. 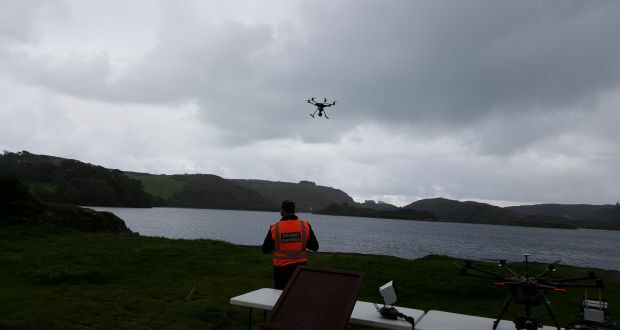 The Irish Civil Defence chose to demonstrate in West Cork just how valuable a resource a drone – or small unmanned aircraft – can be in assisting a whole range of emergency services in a multiplicity of situations. West Cork Civil Defence Officer Niall Twomey explained that, while it wasn’t “a magic solution” to every emergency, a drone can be an invaluable support to agencies such as an Garda Síochána or the Irish Coastguard in the search for a missing person as well as other emergency services. “It’s an ideal resource in areas like West Cork where you have a lot of upland terrain and rocky headlands as well as huge stretches of coastline – the drone can get into these places much faster than searchers on the ground so it can be a huge assistance,” he said. Members of an Garda, the Irish Coastguard, the HSE National Ambulance, RNLI, West Cork Underwater Search and Rescue and Schull Community Inshore Rescue gathered at Lough Hyne in Skibbereen to watch the demonstration by Civil Defence pilots George Vladisavjevic and Tim McKnight. Also watching were members of Cork County Fire Service and Irish Civil Defence Technical Officer, Kevin Houston who explained that he came up with the idea of using drones when he read an article about how the Australian Fire Service used them to gather information on forest fires. “We can offer it to the gardaí or the Coastguard in a missing person situation but we have also used drones in mass casualty training exercise such as a bus crash or a train crash to give the National Ambulance Service an eye in the sky so they can better co-ordinate their operations, “he said. Mr Houston revealed that the Civil Defence has to date invested around €80,000 in drone technology with nine drones deployed in the main eight civil defence emergency areas. It plans to spend a further €70,000 in enhancing the service over the coming months. “We have got special permits from the Irish Aviation Authority which allows us to fly to 500 metres range and to heights of 120 metres and the reason for that is that we run an intensive training programme and all our drones are operated by a pilot and a co-pilot,” he said. Drone pilot George Vladisavjevic explained just how useful the technology can be as he flew the battery powered drone, which has a 20 minute flying time, out some 500 metres to an island in Lough Hyne before flying it back to a furze covered hillside behind the lake in less than a minute. Share the post "Drones hailed as major resource in emergency situations"